Less Expenses. More Research. More Results. 98 cents of every dollar spent goes to research. 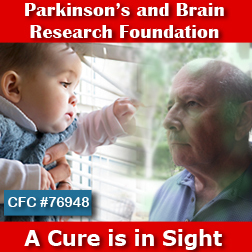 Cutting-Edge Research in an effort to Cure Parkinson's Disease! Our Goal ... A Cure! The Parkinson's and Brain Research Foundation is seeking a cure for Parkinson's disease by funding prominent medical researchers who are focusing on the GBA Link. Researchers at Harvard University, the National Institutes of Health, and University College London discovered the most common genetic risk factor for Parkinson disease - mutation of the GBA gene - a gene that causes a rare hereditary brain disorder called Gaucher. Importantly, carriers of this Gene are predisposed to the development of Parkinson's. Our International Scientific Advisory Board chooses cutting-edge multi-disciplinary medical research - research that takes a 21st Century approach - a new approach to solve the mystery of Parkinson's. One Small Discovery - can unlock the mystery. Your Gift - can help find a cure.